Manufacturing is a major wealth producing sector of the economy. Moreover, manufacturing caters to the needs of the society, by providing what the society needs. As such, manufacturing is really a very important component not only in the existence of man, but the advancement of civilization as well. There are many categories that fall under the manufacturing industry. Some of these are the chemical industry, engineering, food and beverage, energy development, industrial design, plastics, metal casting, textile, transportation, telecommunications, electronics, and metalworking, to name a few. Like all the other manufacturing categories, metalworking is very important as well. In fact, metalworking is not just an industry, but a hobby, trade, and science as well. Basically metalworking is the process of creating individual parts, or large assemblies. In metalworking, various metalworking machines and machine tools are used in working metals. Some of the common machines used in the metalworking industry are lathe machines, drill presses, welding machines, soldering machines, and grinders among others. Indeed, various tools and machines are required in the metalworking industry because of the variety of jobs and processes that are required from this industry as well. Among the number of machines employed in this industry, the grinding machine is one of the most commonly used. A grinding machine is used for grinding, shaping, and cutting solid materials, most especially metals. Usually, the grinding machine uses an abrasive wheel as the cutting tool. The abrasive on the surface of the wheel is practically responsible for performing the chipping and cutting operation of the grinding machine. Grinding machines remove material from the workpiece by abrasion. However, since there is a lot of friction that results out of the physical contact between the cutting tool and the workpiece, substantial amounts of heat are generated. As such, grinding machines incorporate a coolant to the workpiece to reduce the generation of heat in the grinding process. 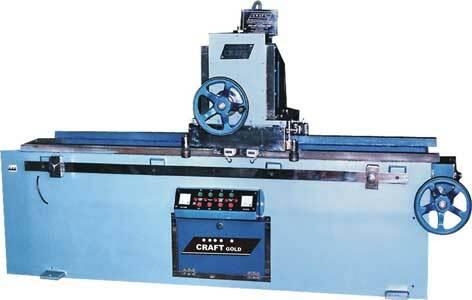 Different types of grinding machines are used for different types of grinding works. The most common types of grinding machines are belt grinder, bench grinder, cylindrical grinder, gear grinder, jig grinder, tool and cuter grinder, and surface grinder.